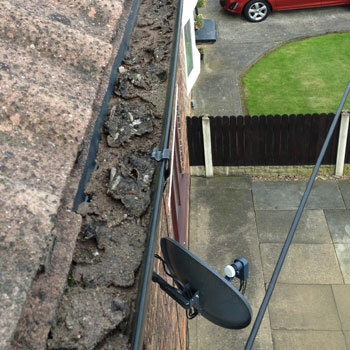 Johnsons Drainage also carry out gutter clearance, repairs and full installations at very reasonable rates in Doncaster and the surrounding areas of South Yorkshire and West Yorkshire. Most people under estimate the importance of guttering and fall pipes. Guttering is one of the most important features of a house, taking excess water to the drain and away from your property. 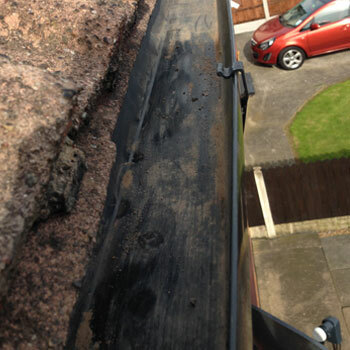 Blocked gutters can lead to them overflowing down outside walls, sometimes leading to damp problems. If your gutters are blocked or filled with debris, then your property is at risk of damage. Leaves and debris in your gutter can block the down pipes leaving the water with no where to go, but to run down walls and worst case scenario into your wall cavity. Blocked gutters cause wooden soffits and fascias to rot which leads to the whole gutter system, fascias and soffits needing to be replaced. This is a lot more expensive than having regular maintenance carried out to avoid this. If you suffer from damp in your property we strongly recommend checking your guttering. Water from blocked overflowing gutters can go into the wall cavity causing damp and also run down the exterior wall which will damage the bricks and mortar leading to it needing re-pointing. Also, if your gutters are blocked the weight from debris, ice and snow will cause strain on the brackets leading to expensive repairs when they break. With regular gutter maintenance you can prevent all of these issues. We value our customers and their recommendations by word of mouth are very important to us and we strive to do quality work at more than reasonable prices. Gutter cleaning can be as simple as clearing debris before a blockage occurs. We use a specialised vacuum that enables us to clear gutters in difficult or awkward to get to locations. We can carry out general maintenance and clearing of your gutters that will help to prevent costly blockages requiring further work. Annual cleaning is recommended as part of a regular maintenance plan, usually carried out in autumn. If your property is near trees that shed their leaves these can quickly build up and un-noticed lead to blocked gutters and fall pipes. Please note that our gutter clearance service is to remove debris and blockages, not to clean the outer face of gutters or facias.